The Open EDge: Could the Nook Color be the Tablet Surprise of 2011? Could the Nook Color be the Tablet Surprise of 2011? As anyone who reads my blog or follows me on Twitter knows, I'm not a particular fan of Apple's iPad. I find it to be too big, too expensive, too locked down, and too beholden to the whims and restrictions (DRM, etc) of one company. They have been largely oversold, with pundits of all sorts positioning them as the holy grail of technological invention, falsely predicting that they will summarily squash less expensive, more capable rival technologies in one fell swoop. And why wouldn't they say such things? After all, tablets combined with tightly-controlled, proprietary ecosystems represent the last, best hope for the "pay-for-play" model of media and content providers who have been decimated by the liberation of information on the web. "These are awesome! You really should buy one!" is really a cover for regaining the ability to control what you see, what you do, and how you consume content and media. Naturally, I've been watching the market closely for alternatives to Apple's overpriced (and costly - there's a difference) iPad, waiting for the ideal competitor in the much more open and free Android space to appear. Unlike Apple's iOS, Android is an "open" operating system whose source-code is freely available to download, modify, and improve. Also unlike Apple's iTunes Store, the Android Market for applications is free and open, enabling anyone to offer applications to Android users without fear of being denied access because some arbitrary panel decided their application competes with a preferred offering/revenue stream, generates "confusion", or they simply don't like it (like Adobe Flash). In short, Android treats you like a grown-up, capable of making your own decisions, instead of like sheeple who need a shepherd to lead them - a shepherd with his own and his partners' best interest at heart. (For more on Android vs. iOS, see CNET's Top 5 Reason's why Android is better than iPhone (iOS) - just don't try it on an iPad/iPhone, it won't play due to the aforementioned Adobe Flash issue). In my opinion, the ideal Android-based competitor would be priced appropriately/competitively based on its capabilities, have excellent hardware/build-quality (similar to an iPad), and be quite easy-to-carry/portable (ie not a heavy, luggable a la the iPad). In particular, by priced appropriately I mean if it can't do anything more than a netbook, it ought to be priced comparably to a netbook, perhaps with a slight (but not exorbitant) premium for size/experience. Sadly, what has been coming out of the Android space up until now has been somewhat disappointing. The tablets that have been appropriately priced have been poorly designed, cheaply built, and generally lame. The well-designed models, like Samsung's Galaxy Tab, have been overpriced like the iPad - far too expensive to justify based on the device's capabilities. We'll see what the Consumer Electronics Show for 2011 brings next week, but based on what has been leaked so far, things don't look to improve. Enter Barnes & Noble and the Nook Color. 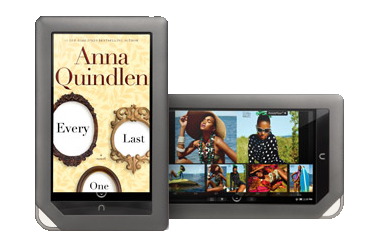 Under the guise of an eBook Reader, Barnes & Noble has delivered one of the best designed, most enticing Android tablets on the market. The device is an ideal mix of price, performance, style, and substance, with a better-than-iPad capacitive IPS touchscreen display, more internal memory, and a similar processor - all in a far more comfortably-sized package. And at less than half the price, the Nook Color is far more accessible to the average consumer - almost inexpensive enough to be an impulse buy. The build quality of the Nook Color is quite excellent - it really feels like a premium device. Though it is largely made out of plastic and rubber, the 0.48 inch thick, 5 x 8 inch slab feels exceptionally sturdy. The entire back is flat and covered in rubber, adding to the premium feel and making the device not only easy to grip, but also quite stable when perched on legs or laid flat on a tabletop. And at less than 1 pound, you won't be hunting for something to perch it on after a short time holding it in one hand. The width is excellent for typing, enabling you to easily thumb type in portrait mode at a rapid clip. Even in landscape mode, while it may feel a bit stretched for smaller hands, thumb typing is still quite doable. The small width and rubber back also make one-handed typing far more pleasant and less stressful, as it will be far less likely to skew and strain your holding hand as you poke at it with the your free one. Better still, at 5 x 8 x 0.48 inches, it's quite easy to pack into a purse or other small bag - even a large jacket pocket. And Barnes & Noble smartly recognizes that style is important, offering more than 50 cover options, a number of bags, and even a selection of charms for the signature loop in the bottom corner. Contrast that with the heavier, 1.5 pound, 9.5 x 7.5 inch iPad, whose slick, curved back makes it difficult to perch, incapable of lying stably on a flat surface, and generally unruly in one hand for more than the shortest amount of time. And it doesn't take long before one must Come to Grips with Lugging an iPad. You just don't whip out an iPad on a whim, at least not without looking for someplace to sit. Beyond physical design, using the device can be quite pleasant. Anyone familiar with Android will understandably see a lot of similarities in the user experience on the Nook Color. Out of the box, it is an excellent e-reader, with an extremely sharp display that is quite easy on the eyes. Barnes & Noble's user interface is very well thought out, including single tap page turns, swipe multi-page turns, double-tap to bring up a swipe-able thumbnail view/navigator for the entire document along the bottom (particularly good for magazines with lots of ads), and, of course, the expected pinch-to-zoom feature. The built in shopping interface is also well thought out, taking advantage of the touch interface and device layout, with all the multi-category, "you might also like" features we have come to expect in an online store. And since you can mount the device on a desktop or bring your own content on a microSD card, the Nook Color offer extensive file format support, including EPUB (Non or Adobe DRM), PDF, XLS, DOC, PPT, PPS, TXT, DOCM, XLSM, PPTM, PPSX, PPSM, DOCX, XLX, PPTX, JPG, GIF, PNG, BMP, MP3, AAC, and MP4 video files. But the real magic is hiding under "Web" and "Extras" in the on screen toolbar, where you will find a full-featured, WebKit-based web browser and a number of Android apps and games. Out of the box, there are only a few apps - games like Sudoku, chess, and crossword puzzles, a media gallery for pictures and video, a music player, address book, and Pandora internet radio. But if you root the device (ie take full ownership of it by giving yourself complete rights to the software on it) you can install the full Android market and nearly any app you want, turning the Nook Color into a full-fledged Android tablet. Anything you can think of is probably available among the 200,000 Android applications available in the Android Market (see the AppBrain site, if you'd like to browse among the best of the best). Google users will love the (understandably) extensive support for Google applications, especially the functionality of the GMail and Google Calendar apps. Social media buffs will appreciate Twitter, Facebook, Seesmic, and countless other social media apps. And top games like Angry Birds and Flight Frenzy, which look incredible on the Nook Color's high-resolution screen, will surely keep you entertained for hours on end. As for multimedia applications, apps like Doubletwist bring a great media experience, with the ability to wirelessly sync your all your music, videos, and pictures (including your iTunes and iPhoto libraries) with ease to the Nook Color. Almost every major app for iOS has an Android counterpart that is just as capable, easy-to-use, and fun, all running on the great features of the Android operating system, including full multitasking support and a superior, unobtrusive notification system. So why do I think the Nook Color might be the surprise of 2011? Because Barnes & Noble isn't trying to attack the iPad head-on, claiming to be the ultimate alternative, and thrusting themselves headlong into the same fanboy war-of-words that ensued with the Galaxy Tab. Instead, Barnes & Noble is taking it's cues from Apple and focusing its efforts on producing the best product in a category - in this case, a great e-reader - at an excellent price, and getting it into the hands of as many people as possible while quietly adding capabilities that might just leapfrog the competition, seemingly out of nowhere. Think about it - Barnes & Noble already is a well-respected brand with a great store, along with a companion device that they are getting into the hands of millions of customers. And, with Android outselling iOS in the mobile marketplace, it's only a matter of time before developers make the Android Market bigger than that of iOS. Barnes & Noble's strategy appears to be just that. With the quiet release of developer documentation and an SDK, along with an impending upgrade to Android 2.2 (Froyo) with their own app market (and Adobe Flash) support, the pieces are in place and the puzzle is coming together, with Barnes & Noble showing a significant lead over the competition. What's more, their willingness to let users own (ie root) their devices and improve the software gives them a leg up in development, enabling them to leverage the strengths of the open-source community's developer pool to freely enhance the device and its capabilities. Could the Nook Color be the tablet surprise of 2011? I don't know about you, but I'm sure looking forward to watching its story play out! Hi Stacy,Here is what I learned.1) Download Adobe Digital Editions on your cuompter (NOT on your Nook).2) Make sure you have a digital account with your library, and check out a book using their process. The book should open up in Adobe Digital Editions.3. Connect your Nook to the cuompter using the USB connector. You may have to turn on your Nook, but then when you have Adobe Digital Editions up, you should see that it recognizes your Nook on the bottom left.4. Find the library book you downloaded onto Adobe Digital Editions (still using your cuompter). Then all you have to do is drag and drop it to the Nook folder on the bottom left.5. 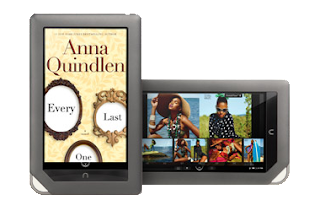 When you open up your NookColor, go to Library > my files > Digital Editions and that is where you will find the library book on your NookColor. The Nook may be different regarding navigating the menu to where the digital editions is located, I have never used the Nook before. Only the Nook Color. But the process of checking the book out of the library is the same. To return a book, you have to left click on the little arrow to the left of the book's title, and a drop down menu will open up, and choose return borrowed book . There also should be a little sash across the book telling you how many days left you have until you need to return it. I try to keep my library books only a few days max, because usually there is a long wait, and I am a fast reader Good luck. Let me know if you have any more specific questions.